Exceptionally large flowers are up to 3” across and flower mid-June until frost. In the heat of summer they’re almost solid white but are flushed with varying shades of red-violet with darker eyes and petal edges as the nights become cool in autumn. The coloration is an amazing breakthrough for large-flowered tickseed. Grows 45-60 cm tall and 60-75cm wide. Growing Tips: Plant in moist, well drained soil that is high in organic matter. 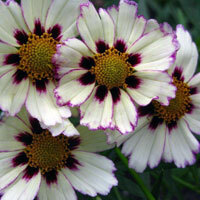 Crisp white flowers with a defined burgundy eye at the base of each petal. Coloration may be predominantly white in the heat of the summer with more burgundy showing closer to first frost. Grows 60-75 cm tall. 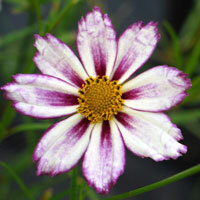 This is a is a perennial plant of the genus Coreopsis in Asteraceae. 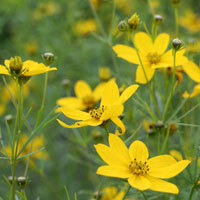 The common names of the species are whorled coreopsis, thread-leaved tickseed, thread leaf coreopsis, and pot-of-gold. It is a verticillata is an herbaceous perennial.de, although as it spreads laterally by rhizomes. this width can be exceeded. The stems are wiry. 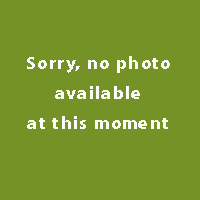 It is an herbaceous perennial. The stems are wiry. The stems are wiry. The flower heads are up to 2 inches across, and both the disc florets and ray florets are bright yellow. The flowers are produced abundantly in clusters from mid-summer to fall. 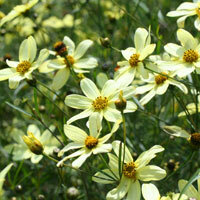 This Coreopsis verticillata ‘ Zagreb is a bit shorter than the Coreopsis verticillata ‘ Moonbeam . This cultivar has bright yellow flowers that sit on long, erect stems. Throughout the summer by the yellow flowers appear richly to the plant. By deadheading the will to remove the plant longer from initiation. The plants do fine in poor sandy soil and rock gardens. In addition, it is a good cut flower.